Powerful yet tormented warlock Quinn Fairmont must initiate the silver-eyed Cade Mairston into the world of witchfinders, Withinners, and what can happen when two men fall truly, madly, deeply in love. In modern London,, there lurks a warlock. Quinn Fairmont. Dangerous, powerful, tortured. Sharing his body with the soul of an ancient Welsh sorcerer, Quinn is never alone—and never wholly himself. He fights against all those who would exploit his kind. He also takes pleasure where he can find it. In the forest of Hampstead Heath, Quinn’s hometown, Cade Mairston appears like a waking dream. Lithe, lean and silver-eyed, he evokes feelings in Quinn unlike any other: along with lust comes true affection, immediate and shocking. Cade is clearly more than he seems. And yet, though a man of the world, Cade knows nothing of warlocks, witchfinders or Withinners. He knows nothing of what he is, what he might be, what he might feel. For him, the story is just beginning, and magyck, peril and passion await. 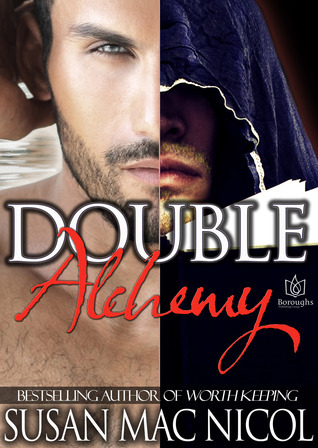 Double Alchemy is a paranormal m/m romance. We get to meet Quinn and Cade, they both have a very intense first meeting, which leaves Cade feeling a bit confused. While he finds Quinn extremely attractive, he cannot explain his immediate reaction to the man, after leaving their first encounter, Cade plays off his feelings as just a freak reaction to the man. Quinn knows there is something lurking inside of Cade, although he senses that Cade has no idea what he may truly be. When Cade and Quinn meet up again, Cade’s reaction to Quinn is not any less explainable than what it was before. When Quinn tries to explain to Cade just what it is that is going on between each other, Cade is brought into a world he never expected. While learning that things of magyck actually do exist, and finding out that Cade may be as special as Quinn is, Cade is determined to not only learn more about himself and his family, but to also learn about Quinn. Quinn has secrets, Cade has no one who may be able to answer questions about who and what he is. Can these 2 continue to figure out each other along with their relationship? This is the first book with the second to be released shortly after. I can’t wait to read the next book, while this book is not left with a cliffy, it does leave you wanting to know more. I will be watching out for release dates to keep you all up to date as well. I enjoy Susan Mac Nicol’s writing style, and with this being a mixture of paranormal along with a m/m book, I was intrigued. I am looking forward to the next installment to this story. 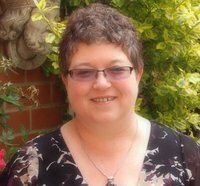 Posted in Author Biography, Book Review, Links, Penny Pam, Synopsis, Uncategorized. Bookmark the permalink.